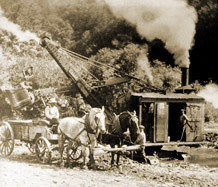 In those days, aside from steam shovels and steam rollers most of the work was done with pick and shovel. It was not uncommon to have over 100 men living in barracks built on the job site. The construction season started with the spring thaw and continued through the first frost in the fall; in winter, construction workers looked for jobs in factories. When World War I started, Joseph, now a U.S. citizen, joined the army with the 132nd Engineers. After the war, he returned to the construction industry as a superintendent for his brother’s company, John Arborio Inc., where he remained until John moved the company from New Haven to Poughkeepsie, New York. Rather than leave Connecticut, Joseph went to work as a general superintendent with his cousin, “Little John,” who owned the Arborio Road Construction Company in Hartford. In 1939, he and a co-worker started the Charter Oak Construction Company, successfully taking on jobs throughout New England and New York. In 1963 when Charter Oak Construction Company discontinued its highway operations, Joseph and his son "Bing" Joseph Arborio founded the Arborio Corporation. And to continue the family tradition, Bing’s sons have all joined the company. Arborio Corporation has grown into one of the premier bridge and highway contractors in the Northeast and, since 1986, has included Charter Oak Utility Constructors as an affiliate.